In Goon, released on DVD and Blu-Ray by Entertainment One on 4th June 2012, Doug Glatt may not be the sharpest blade on the rink, but he's got a killer right hook! 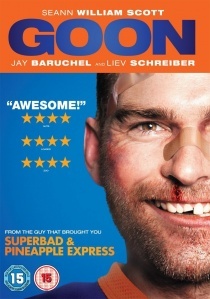 In Goon, released on DVD and Blu-Ray by Entertainment One on 4th June 2012, Doug Glatt (Seann William Scott, American Pie, Role Models) may not be the sharpest blade on the rink, but he's got a killer right hook! When his best friend (Jay Baruchel, Knocked Up) runs into trouble, Doug's ability to beat the crap out of everyone and everything impresses the coach of a failing ice hockey team who quickly enrol him as protector of their screwed up ex-star player, La Flamme.